Prince William, Duke of Cambridge KG KT ADC(P) (William Arthur Philip Louis; born 21 June 1982), is the elder son of Charles, Prince of Wales, and his first wife Diana, Princess of Wales. His paternal grandparents areQueen Elizabeth II and Prince Philip, Duke of Edinburgh. He is second inline to succeed his grandmother, after his father. Second stamp is a No Value Indicator (NVI) stamp and E rate is valid for letters to Europe weighing up to 20g (the first weight step). Sold for 38p on the day of issue. Background colours are printed with iriodin ink giving the stamp a three dimensional appearance. Royal Mail discontinued the use of the “E” indicator in 2004. According to Royal Mail, customers thought the stamps had something to do with the euro, the European currency that has not been adopted in the United Kingdom. Denominated Machins and regionals were issued to replace the “E” stamps. It is possible that there were other, unstated, reasons for discontinuing the “E” stamps. The queen has authorised Prince William's 21st birthday next month to be marked by new stamps bearing his photograph and for the first coins to be struck in his image. The Royal Mail and the Royal Mint have given exclusive previews of the commemorative designs to The Telegraph. 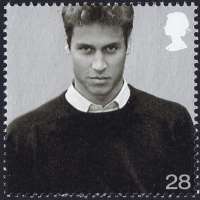 The Royal Mail is so confident that the issue will be a success that it is printing more than 20 million stamps bearing his image. They will go on sale on June 17, four days before his "coming of age". The Queen and her grandson, who is studying history of art at St Andrews University in Scotland, have approved the images: two show Prince William in casual clothes, two are of him dressed smartly in a suit and tie. The four stamps are for 28p (first class), E (37p: the basic letter rate to Europe), 47p (the basic airmail letter rate up to 10 grams) and 68p (the basic airmail letter rate up to 20 grams). 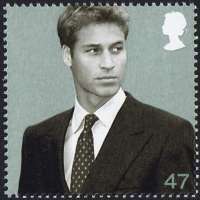 William's father first appeared alone on a Royal Mail stamp in 1969 to commemorate his investiture as Prince of Wales. He first appeared on a coin in 1981 when he married Lady Diana Spencer. 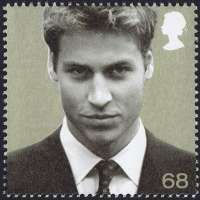 Prince William made his British stamp debut in 2000 when four generations of the Royal Family appeared on a series of stamps to commemorate the Queen Mother's 100th birthday. 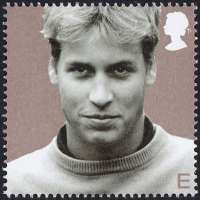 The photographs of Prince William used for the new stamps were taken in Scotland and at Highgrove, his father's country home, and show him aged 18 and 19, during his gap year and when starting university. Two were taken by Tim Graham, the royal photographer, the others by Brendan Beirne and Camera Press. The stamps, which were designed by Madeleine Bennett, will be available in presentations packs, costing £2.20 and featuring 21 photographs of the Prince, one for each year of his life. They will also be available on first day cover envelopes costing 25p. Gavin Macrae, the director of stamps and collectables at the Royal Mail, is convinced that the new issues will be an overwhelming success. "We expect these striking images of Prince William will have worldwide appeal with both the public and collectors alike," he said. "We were delighted when the Palace agreed to a set of commemorative stamps being released to mark this special occasion." The Royal Mint is issuing its first coin of Prince William - an Alderney £5 crown - to go on sale on his birthday. It will be available for less than four months, with the last day of sale on September 30. The crown will bear a portrait of Prince William modelled by David Cornell, the sculptor and artist, from photographs taken by George Bodnar. It will have the words "HRH Prince William of Wales" and in the background will be his personal coat of arms given to him on his 18th birthday. On the reverse side of the coin will be a portrait of the Queen by Raphael Maklouf. The coin has been struck to "Brilliant Uncirculated" quality, a higher quality than standard coins. The Alderney £5 crown will be available in a presentation pack, costing £9.95. Mr Cornell, 67, who lives in East Sussex, has extensive experience in crafting images of members of the Royal Family. He made the models for the memorial coins for Queen Elizabeth the Queen Mother last year and Diana, Princess of Wales in 1999, two years after her death. Limited-edition coin sets have also been produced to mark the occasion. Mr Cornell, an engraver with the Royal Mint in the 1960s, said yesterday: "It was an enjoyable task because Prince William is such a good-looking guy. He insisted on using images of himself smiling, which was difficult for me. It is hard to produce a smiling coin because it is tricky to do the teeth, but I managed in the end." Mr Cornell spent a week working on each of the three coins. "I sculpted them in clay on a plaster base in a circle eight inches wide. It was quite a challenge but I am pleased with the results." The limited edition coins are a gold three-coin set incorporating crowns from Jersey, Guernsey and the Channel Island that has an issue limit of 200 and costs £1,745; a silver three coin set with an issue limit of 5,000, costing £99; and an Alderney silver kilo coin with an issue limit of 500, costing £695. It is expected that the sale of the coins will cover the cost of producing them but not make a profit. Gerald Sheehan, the chief executive of the Royal Mint, said: "The coins are expected to become popular with collectors and members of the public alike."